This is the end of day 2 here with just 1 day remaining. It is really really too bad we couldn't get more time but the hostels are just booked up solid. Craziness I tell ya! 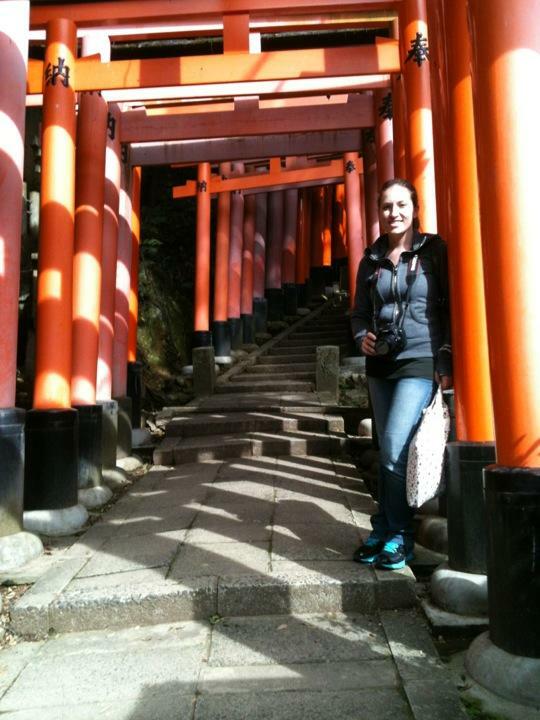 The first day we went to the inari shrine to see the many torii gates and hike the mountain they call home. This area and the shrine are dedicated to gods related to grain, sake, etc. and is represented by a fox spirit. Really great place and experience. The only downside was it was Sunday which is everyone's day off here so it was crazy busy. Other than a bit of pushing on the train, not a problem! Today we wandered the Gion district which is old Kyoto, where the geisha and the apprentices, called maiko, live and perform. We saw an incredible authentic performance and tea ceremony. We actually got to keep our plate too! We only knew this by watching old ladies all around us stuffing them into their purses. We even saw a real maiko on her way to a job and managed to get a picture! After that we wandered some local temples and graveyards and took lots of pictures. Then we spent the remainder of the day shopping. This killed the time faster than could be believed and suddenly it was dinner time. We had dinner at a ninja themed restaurant and they showed us ninja magic. It was cute, if not a touch touristy.